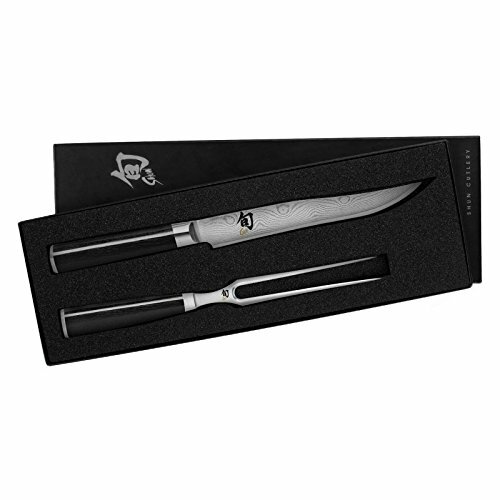 A thoughtful housewarming or wedding gift, this two-piece carving set by Shun includes an 8-inch carving knife and a two-pronged carving fork. Use the pair for gracefully carving turkey, slicing honey-baked ham, portioning off pork roast, and more. The fork keeps the meat stable, while the knife effortlessly creates thin, even slices. Overall, the set measures approximately 15-3/5 by 6 by 1-1/2 inches and arrives in a beautiful gift box. Like other knives in Shun's Classic collection, the knife comes precision-forged in Japan by renowned blade manufacturer KAI. Its eye-catching beauty starts with a VG-10 stainless-steel blade, which features 16 layers of SUS410 high-carbon stainless steel on each side, producing a 33 layered Damascus look, but without the rusting problems associated with Damascus. The Damascus detailing not only enhances the knife's aesthetic appeal, but it also reduces drag and helps maintain the integrity of food when slicing. The knife's sleek good looks continue on into its handle. Offering a D-shaped design for a comfortable grip, the unique ebony Pakkawood handle consists of a fused blend of hardwood veneers and resin to exceptionally noteworthy results. Its steel end-cap offers an attractive finishing touch, and the knife carries a limited lifetime warranty. Though dishwasher-safe, Shun recommends washing the knife by hand. Born of the ancient samurai-sword-making tradition and hand-finished for precision and beauty, Shun Classic is an ideal choice for anyone buying their first Japanese knife or 50th. The high-quality line of cutlery makes a worthwhile addition to any chef's arsenal of tools--it's used by professional chefs and home cooks alike. Produced in the widest variety of specialized styles, the Classic line features both traditional European blade shapes and innovative cutting-edge designs. Shun Classic's amazingly sharp blade is famous for both edge retention and ease of sharpening. Each blade has a core of VG-10 "Super Steel" with a Pattern Damascus cladding of 32 layers of high-carbon stainless steel--16 layers on either side. While the wood grain pattern enhances the knife's beauty, it also adds durability and stain resistance, and reduces friction when cutting. 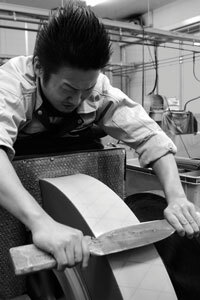 Blade core consists of high-carbon VG-10, a Japanese super steel known for its edge retention, allowing the knives to hold their sharp edges for years. Blades boast a 16-degree angle, making these the sharpest knives out of the box. This is sharper than traditional European blades, which are usually sharpened to 20-22 degrees. Clad with 16 layers of SUS410/SUS431 Pattern Damascus stainless steel on each side for strength and flexibility. This metal is corrosion-resistant and easy to maintain. Damascus styling adds to the beauty of the knife while the microscopic air pockets created by the cladding process reduces friction during slicing. D-shaped handle fits in the palm and provides comfort and control, keeping the knife's handle secure in the hand during use. Available standard in D-shaped handle styles or by special order in reverse D-shaped handle styles. Pakkawood handles, made of resin-impregnated hardwood, are NSF Certified for use in commercial kitchens. Produced in Seki City, Japan, the capital of samurai sword manufacturing. Rockwell hardness rating of 60-61 ensures that it takes and holds its incredibly sharp edge longer. Hand wash and dry recommended; limited lifetime warranty. Cutting angle: 16 degrees per side (comprehensive angle 32 degrees). This is sharper than European knives, ground to 20-22 degrees per side. Handle Material: PakkaWood (resin-impregnated hardwood); D-Shaped handle available in right and (by special order) left-handed versions. 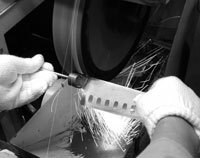 Sharpening recommendations: Weekly honing to maintain the blade, sharpening as needed with professional sharpener or Asian-style electric sharpener.